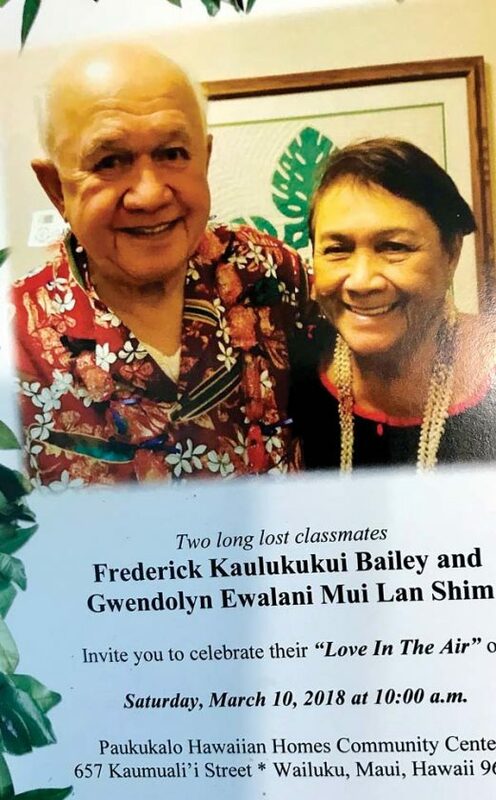 Lahainaluna classmates Frederick Bailey and Iwalani Shim are post-high school sweethearts, as evidenced by last year’s wedding invitation. A Central Maui couple marked their first wedding anniversary during the 60th Lahainaluna class reunion April 13. Iwalani Shim and Frederick Bailey were both pleased to recount their mo’olelo, or story, from an airy, sunlit kitchen. The twosome’s Habitat for Humanity-built house lies at the end of a long driveway in a Waiehu cul-de-sac. Subtle smells of ferns and foliage surround their Hawaiian homestead. Shim’s voice is happy and excited. His is soft and patient as he swivels his wheelchair from table to refrigerator for a glass of orange juice. Their tale starts when the septuagenarians attended different Lahaina grade schools. Bailey was intrigued with Shim’s bow-legged walk and would watch from afar as she made her way to class weekdays. Eventually they became Lahainaluna High School classmates: she a shy student, he a blue-eyed Hawaiian-Irish football player. Still intrigued, he tried to approach Shim. “I had feelings for her,” Bailey recalled. She would have nothing to do with “the only red-haired student at school,” she said. Fast forward 5¢ decades, when Shim was on the Lahainaluna 55th class reunion committee and tracking down missing classmates. She asked Bailey’s niece to have him call. He phoned — there was chemistry. The class reunion was nice; the Shim-Bailey reuniting was fireworks. The couple wed March 10, 2018, amidst children, grandchildren, great-grandchildren and friends from their wide-ranging circles. The duo points with pride to deep community roots. 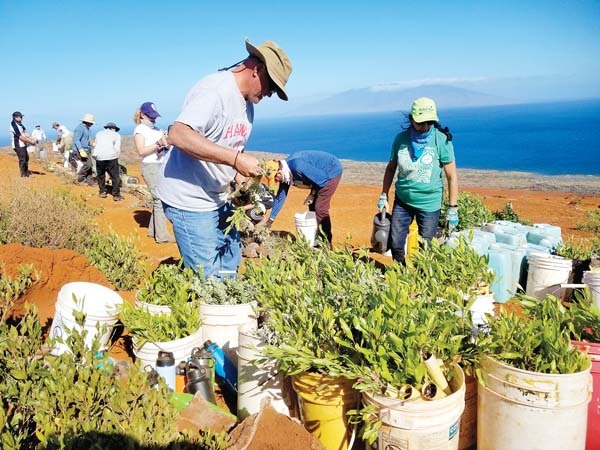 The Shims are a multigenerational Maui ‘ohana with Chinese-Hawaiian branches in Keokea and Wailuku. The Baileys go back to Edward Bailey, who managed the Wailuku Female Seminary starting in 1844. The latter now serves as Hale Ho’ike’ike, or Bailey House Museum/Maui Historical Society, in the heart of Wailuku.